What are those, about a D cup? Cool article, thanks for posting, I can see some similarities to the later produced Greenbriar. Definitely catch some attention driving down the road and looks like it was built like a tank to last. Pretty Kewl indeed! 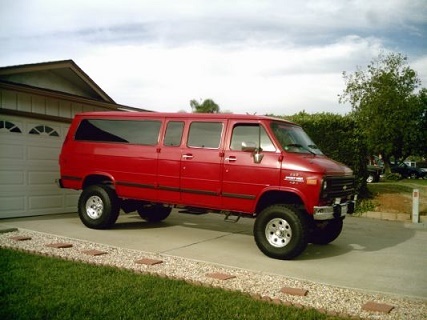 It was designed as front wheel drive and had a Pontiac engine mounted mid-van! 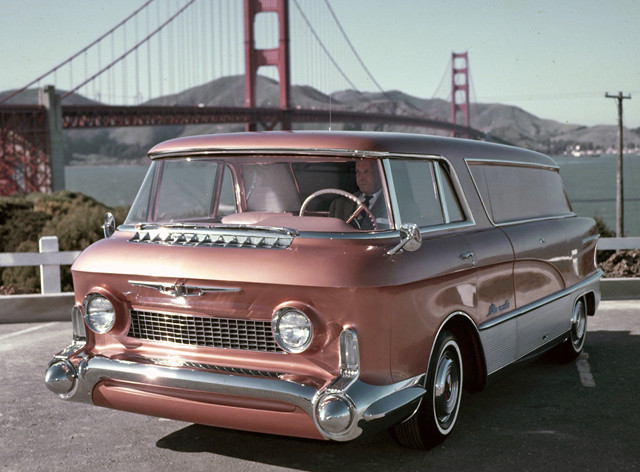 It was conceived as a dream vehicle for the 1955 Motorama series of GM shows held in Boston, New York, Miami, Los Angeles and San Francisco. The L'Universelle that made the show rounds was reportedly a roller only--the transaxle wasn't functional and the engine lacked a working ignition. The powerplant displayed in the L'Universelle was a 180hp Pontiac 288-cu in V-8 coupled to a transaxle. The cooling system was a complicated affair because the radiator had to be located behind the driver and angled skyward toward a roof vent where ceiling fans sucked in outside air. L'Universelle's steering setup was also complex as the column led to a gearbox that turned a vertical shaft leading to another gearbox that turned a horizontal shaft leading to the wheels. Haha! I was thinking either D cup or Marylin Monroe specials but that'll do. Arnt they called Dolly Partons ? Or are the DP the torpedo style ? All I know is I love all that chrome ! 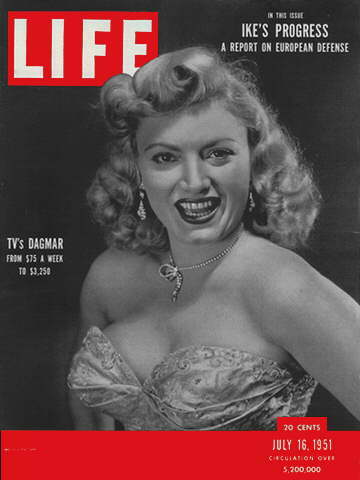 Dagmar's is what I know them as, hence the magazine cover. See the last entry in the "Later Career" section. That is a wicked cool concept van. Wild design for that period!